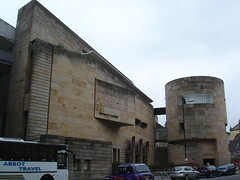 The National Museum of Scotland provides a thorough overview of Scotland’s history spaced out of a half dozen floors, culminating with views over the city. The museum charts Scotland’s geographic development and the history of its human inhabitants up to the present day. One of my few criticisms of the content is the geological section where the territory of Scotland is seen moving across the world over billions of years. However, the rest of Britain is conspicuously is absent right up to the present period. Conversely, the Welsh Museum had a similar exhibit and it all parts of the landmass were included (at least when they came together). Similarly, I tried to understand when homo sapiens arrived couldn’t find information on this. When asked a guide pointed me to a display on the development of Scottish surnames! It’s as though the Scottish Museum is trying to to prove uniqueness and independence. While odd it didn’t detract from the remaining exhibits – although my lack of knowledge means I’m prime material to be misled. Oh well. The Roman period, particularly the bribing of Scottish Chiefs, was particularly interesting. Most of the museum covers the changing natures of the state, religion, the crown and everyday life. I found the story of the Jacobites and the ever shifting allegiances fascinating. On the other hand I was disappointed by the lack of information about devolution. The section covering it was too brief for a non-Scottish person to appreciate the arguments. At the end of the museum I feel like I understood more about Scottish history but still feel lacking in my appreciation of Scottish culture. 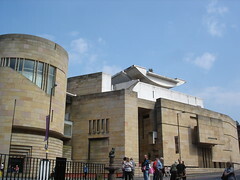 The museum is located on Chambers Street, Edinburgh. It’s free and worth a visit (put aside about 2 hours). More Edinburgh photos at Flickr.